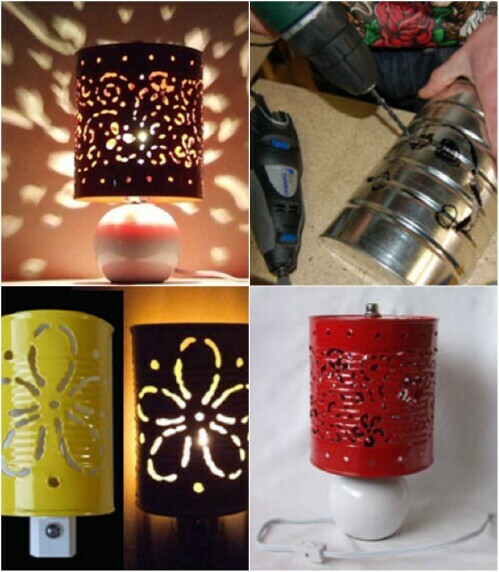 Home » Repurpose » 50 Jaw-Dropping Ideas for Upcycling Tin Cans Into Beautiful Household Items! Even (maybe even especially) when you are strapped for cash, you probably stock up on canned foods every month. Canned foods are cheap, they don’t go bad, and you can use them for all kinds of recipes. What do you do with the cans when you are done cooking, though? You probably throw them right into the recycling bin. Maybe you wait a while to accumulate a bunch before you chuck them out, or maybe you toss them every week. Either way, you are parting ways with a valuable craft supply. 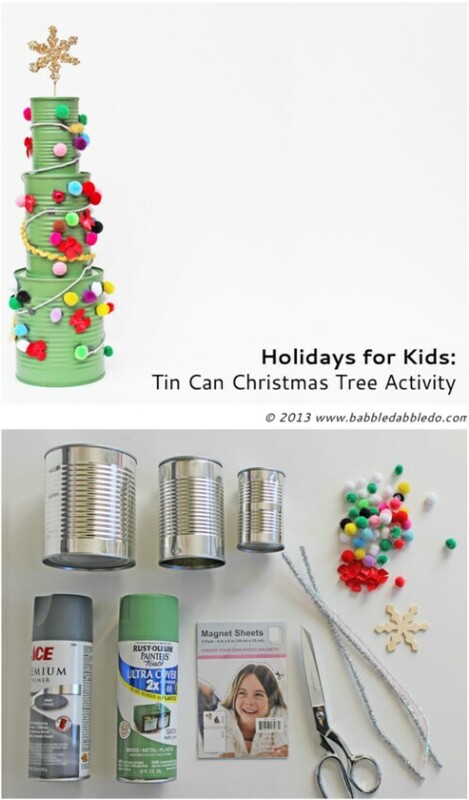 Seriously, you are just not going to believe all of the things you can create using tin cans and other simple and cheap craft supplies! 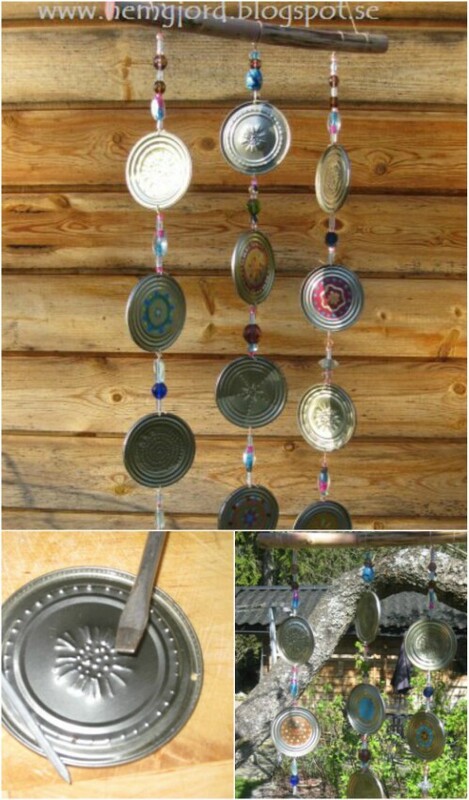 I first fell in love with the idea of converting tin cans into household décor when I saw some gorgeous tin can wind chimes (which I’ll be sharing with you later in the post). But then I ran a few searches online and I stumbled across a ton of equally amazing ideas. These projects don’t stop at decorative items either. 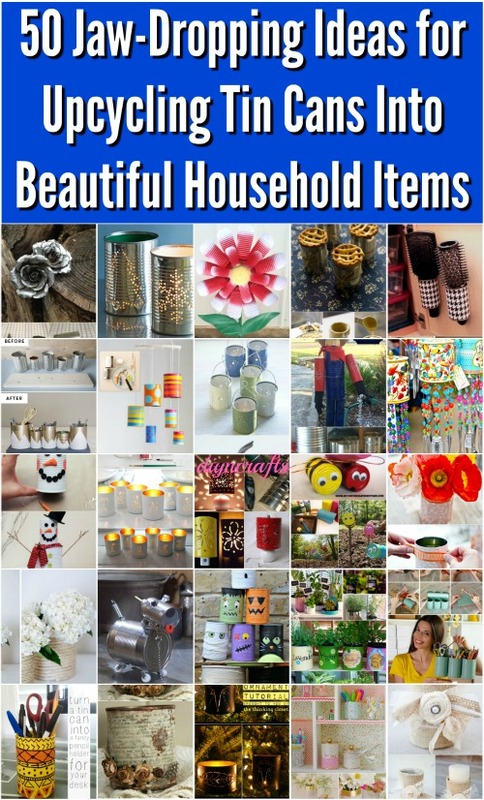 Some of them are useful, like toys for your kids, vases for plants, or lights. There is even a project for a working camera that you can shoot real pictures with—made out of a tin can! How completely awesome is that? Anyway, enough with my “That’s amazing!” talk. Check it out for yourself. 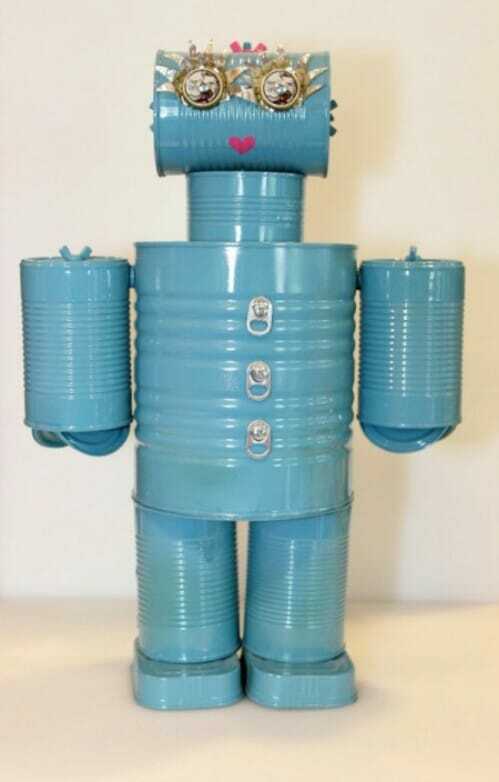 Here are 50 incredible tin can recycling projects that will blow your mind! I can’t wait to try these projects for myself, and I know you’ll be just as excited to do some of these yourself! 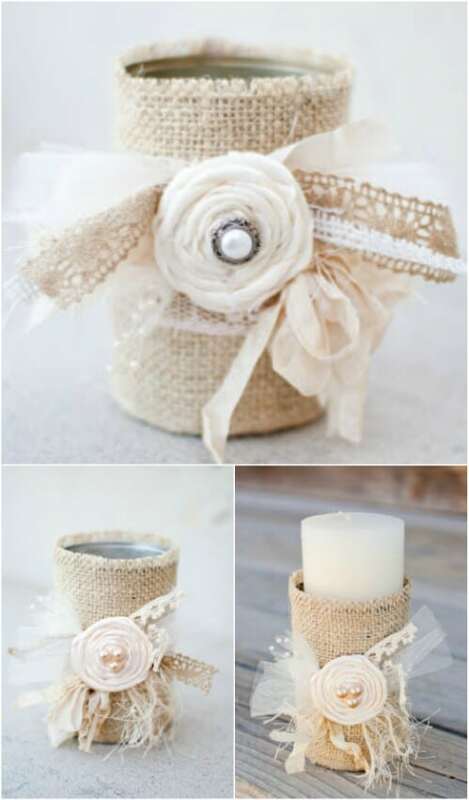 Burlap-Covered Tin Can Candle Holders—Perfect for a Wedding! 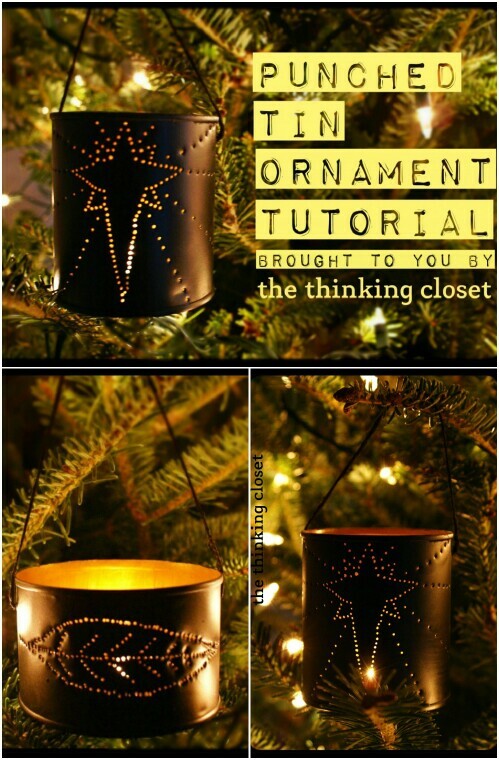 Previously I shared the tin can votive project which included the Christmas tree and snowflake designs. This project follows the same idea and you can make it exactly the same way, only instead of pictures, we have letters marked into the cans. I love this idea to set them up once next to the other so that they spell out a word. They would be a great touch at a party or reception. You can make just about anything into a wreath if you’re clever enough. But not many people would think to use tin cans! 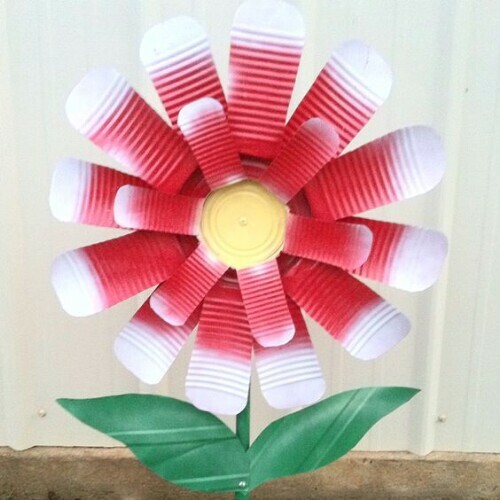 These cans have been painted a bright, eye-catching red and arranged into a simple, attractive wreath for a fence. It’d look awesome anywhere and has great homespun appeal. 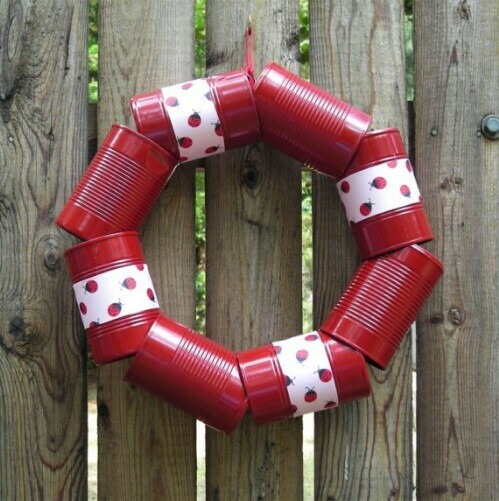 Available on: Etsy Cantastic Red Wreath made from Recycled Cans. While we’re talking about all things homespun, nothing beats burlap for rustic design. 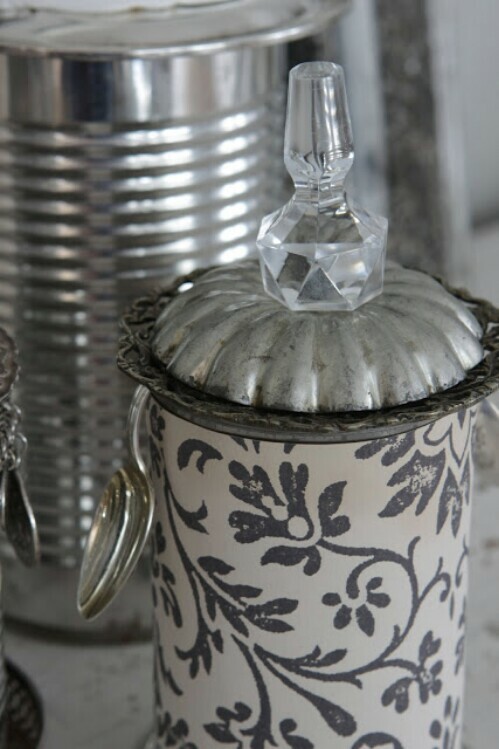 Here is an easy way to recycle a tin can into a lovely candleholder. Just wrap some burlap around it and add some embellishment! This candleholder would look awesome sitting on a banquet table at a wedding reception. Look at these wonderful wind chimes! I just love how bright they are—they would add a splash of color and sunshine to any room. I am amazed at what a perfect job their creator has done coordinating the colors of the beads with the colors on the tin cans. At that rate, I am amazed at how well-disguised these tin cans are. If I didn’t know better, I never would have guessed that they were tin cans at all. Awesome work! You can give someone a rose from the flower shop which will wilt in a week … or you can give someone a rose that will last forever and which is just as beautiful—perhaps even more so in some ways since it was made by hand. These roses … there isn’t enough I can say about them! They are absolutely gorgeous, and in a way they look quite realistic. 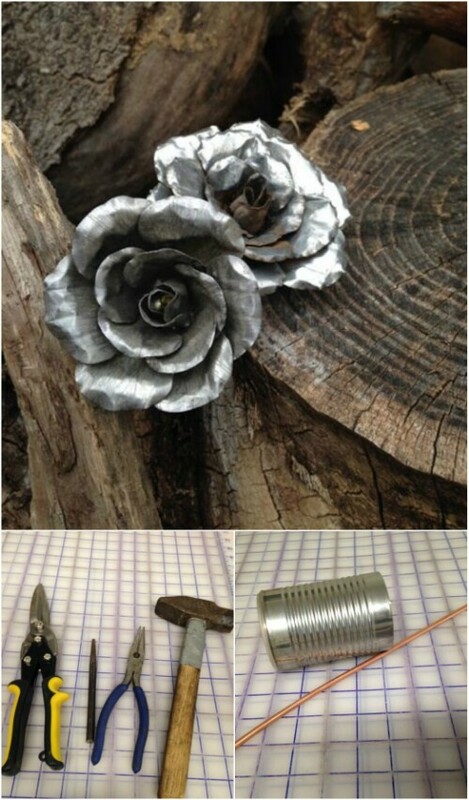 You’d think they’d be super challenging to make, but there are step-by-step instructions which you can follow to create your own tin roses. These would make an incredibly cool gift for someone special in your life, or they’d be great just to keep as décor around the home! Now here is a clever idea which isn’t just aesthetically pleasing, but also genuinely useful. I have all my utensils shoved in my drawer. It keeps them out of the way, but I still seem to have to do a lot of digging to grab what I need. This setup is a lot more convenient. You can instantly see where everything is, and there is a tin for each type of utensil. I love that they have all been connected to a convenient carrying handle too. This would make it ridiculously easy to set the table each day. Remember the rocket grill from earlier on the list? This grill is a simpler alternative. It doesn’t have the same benefits as the rocket grill—it isn’t sheltered from wind and rain, but it does have one advantage, and that is that making it is practically effortless. As you can see, you just cut down the sides, extend them, and then put some tin foil on top. After that, all you need is a cooling rack. This would be great or camping or just for grilling out back behind your house! I am so pleased I have found the source link for this project. It is one which I have seen circulating the web in many places, but most sites where I’ve seen it posted failed to link back to the original project. It’s easy to see why it is such a popular project. 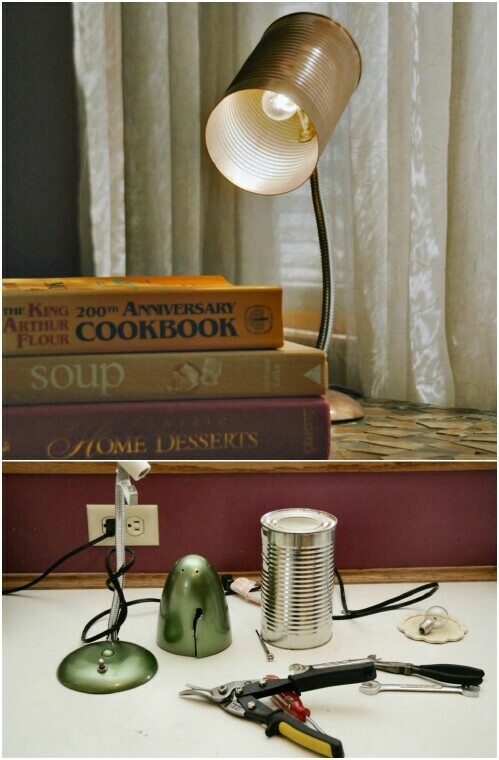 It’s quite clever, and puts a different spin on the idea of using tin cans for lighting. 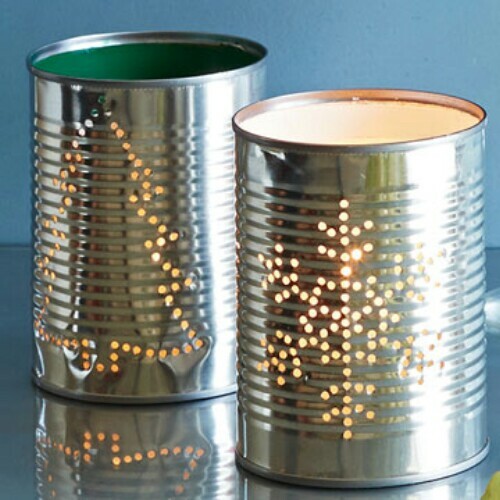 Unlike other tin can light fixtures, these allow you to see inside the can. This works out beautifully since the candle flames reflect inside the tins, producing a really warm and inviting effect. Once again we have tin cans with holes punched in to make a design, but this time instead of stringing the tin cans up as lanterns, we are using them as Christmas tree ornaments! What a smart idea! There are no instructions unfortunately, but the picture sure is enticing, isn’t it? This appears to be much the same idea in principle as the cake shared previously. These would be awesome to give to people at parties. This is the same type of project as the pencil holder with the keyboard wrapped around it from the start of this list. Except this time we are skipping the keyboard, and painting the tin can instead. You can use any colors and designs you want, so it’s a fun project to personalize—and it is way cooler than any old pencil holder you’d buy at the store! These would make great gifts for your office coworkers. 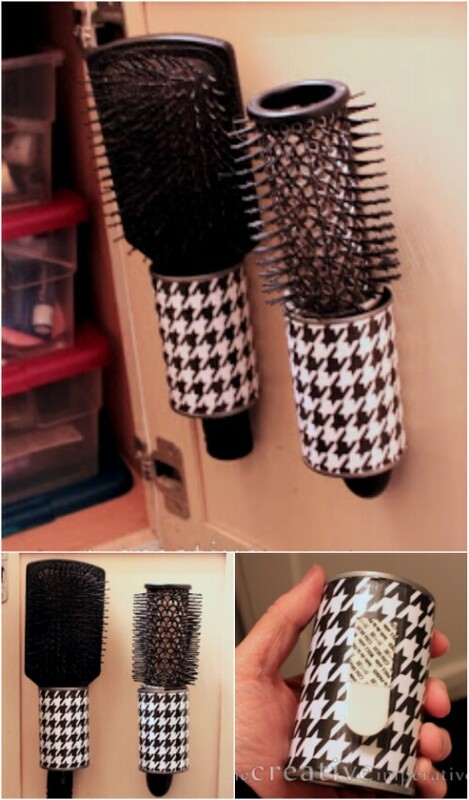 Hate digging around for your hair brushes? Here is one clever solution. Jamie kept her hairbrushes under her sink, and finding them was a pain every morning. She came up with the idea of upcycling tomato paste cans by wrapping them with scrapbook paper and attaching Command strips. They latch right onto the insides of her cabinet doors and are just the right size to hold her brushes. Now all she needs to do in the morning is open the doors and grab them. What a great space-saving solution! 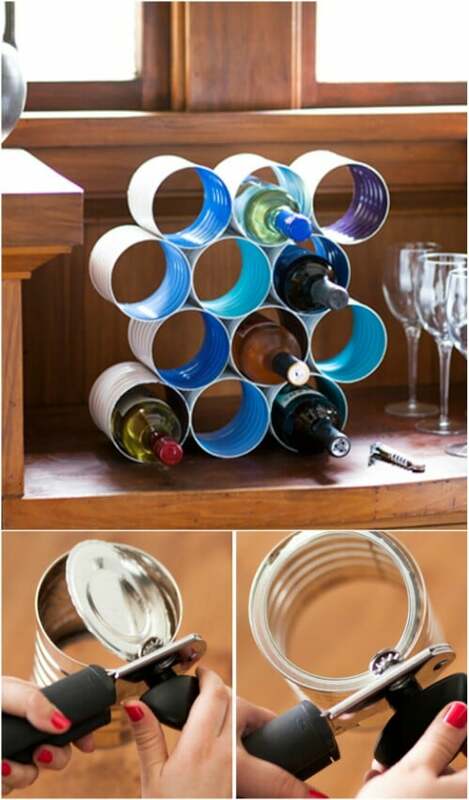 There are a lot of cool designs for wine racks, but this idea of using tin cans has to be one of the simplest and cleverest I have seen. Tin cans are only a little bit larger in circumference than wine bottles, so they work perfectly. Plus, the fact they are a bit bigger would work out well if you purchased something like Chianti that comes in a wider bottle. Have an old keyboard that no longer works? If you are a desk warrior like me, you go through keyboards the way other people go through pens or highlighters. This project gives you something to do with those old keyboards and your other office supplies. I like this project not only because it is a fun and clever concept, but because I personally feel a need to memorialize my old keyboards. When you do as much typing as I do, you get sentimental. What kid doesn’t like walking on stilts? 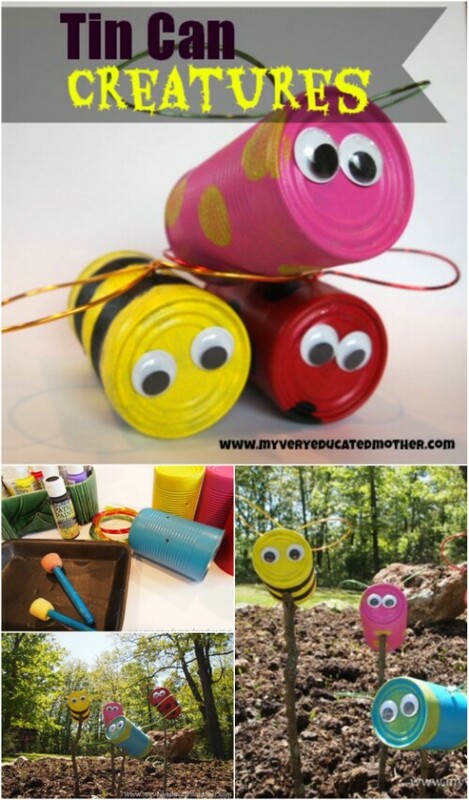 This is a fun and easy way to give your kids something to do that will keep them busy all afternoon. They can make the stilts pretty easily on their own or with a little guidance, and they will have a blast using them. They can paint them with any colors or designs they want. I ran into a cute set of coffee can stilts at one point that were painted to look like elephant feet—clever idea. Wow, how did she get that super cool texture on there? That was the first question I asked when I saw these awesome planters. 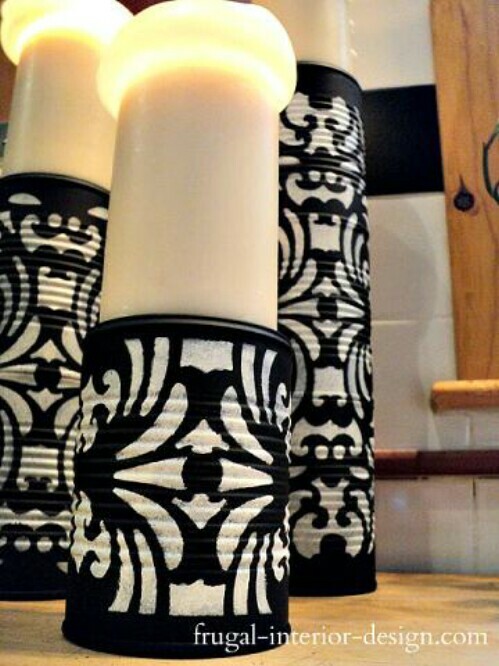 As it turns out, those are paintable wallpaper samples which this clever crafter ordered off the internet. She decided to keep them unpainted to give them a bold contrast with the moss—and to make sure the attention was on the mos. Frankly my eye was still drawn straight to the cool textures on the wallpaper. The project was an awesome success either way! Tin cans actually are pretty aesthetically pleasing just as they are. So sometimes the simplest ideas can have the best effect. You don’t have to do much to transform a tin can into something amazing—without hiding its true nature. 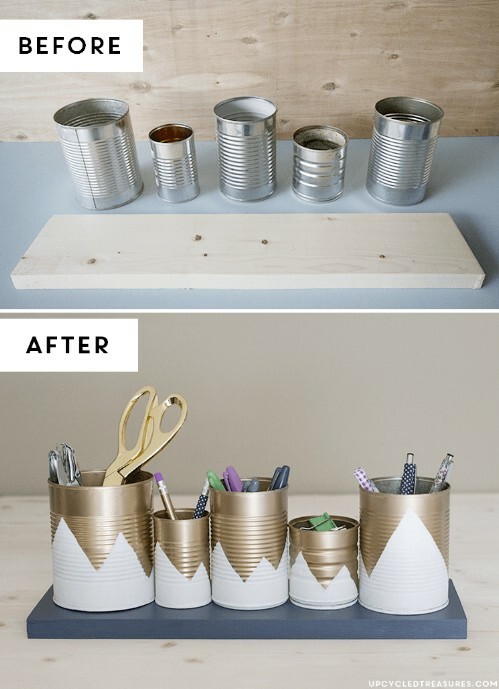 These tin cans have been painted with a simple design and some metallic paint, and the finished effect is great. This is an idea that would be easy to customize to your heart’s content. 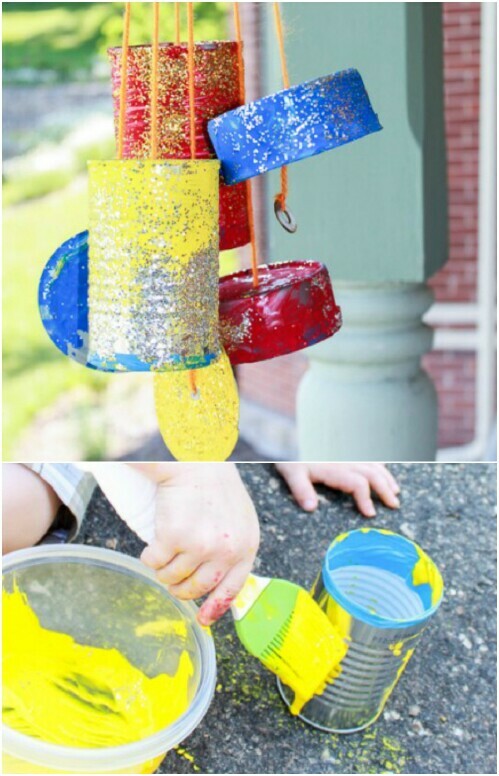 Here is a super easy tin can wind chime project which was designed to be easy for kids to do. Of course, it would be perfectly fun for adults too! I like the “weathered” look of the finished project. The bold primary colors also work very nicely off of each other. 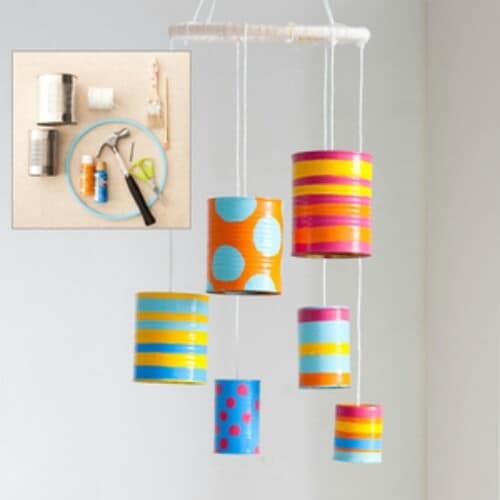 Here is another version of the tin can wind chimes, this time with a different setup and a very different paint job. These chimes use bright, bubbly colors, just like the others I have showcased in this list, but the designs are quite unique. Stripes and polka dots are simple, but they make for a great look! It truly is incredible what you can do with a tin can and a simple scrap of fabric. Each of these tins is quite beautiful. I love the soft colors, and the effect that the entire ensemble has. It is very elegant (nicely photographed too). Once again, sometimes the simplest projects are the ones that come out the best. Enjoy backpacking? 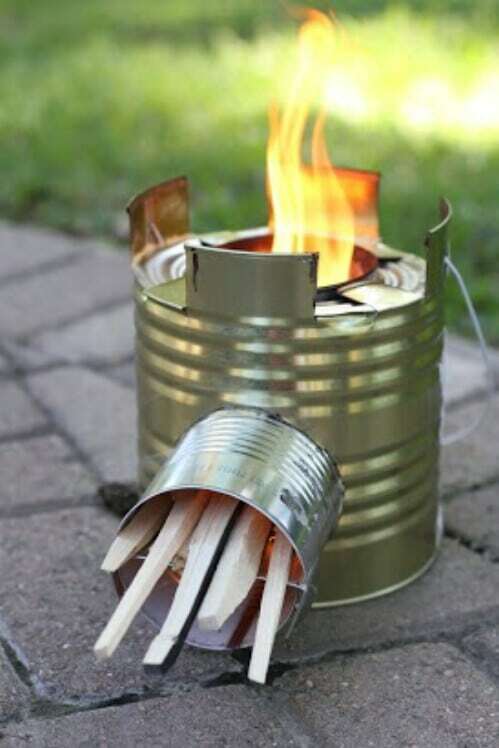 You can easily convert tin cans into a working rocket stove which is small and lightweight enough to take with you no matter where you go. The stove weighs in at a single pound, looks amazing, and can boil water in under five minutes. Because the design is so efficient, it conserves fuel. All you need to start the fire is a lighter or match, some lint from a drier, and sticks. Since you are the one feeding the sticks into the fire, you can control it with ease. There are other great things about this design as well. For one, the fire is protected from the elements. Since it is inside the can, wind and rain are unlikely to dampen it or put it out. For another, it is a very durable design which will hold up great over time. This is a project you could do yourself at home, but I recommend that you take a look at the original site. You can actually buy the rocket stoves right there on the site for a very reasonable cost. They are beautifully designed and available in black and silver. They’ve been insulated to focus the heat inside for greater efficiency, and to protect you from burns. This simple idea has a beautiful effect. The texture of the rope is lovely and indeed has a nautical flair. I imagine that this would be a great touch for flowers at wedding, especially a seaside one—which it seems is exactly what the design was originally for. Perfect for any DIY bride! This would be a more involved project, and unfortunately there are no step-by-step instructions. It is way too beautiful not to include in this list though! And you can get a feel for how it was done if you study it enough. It wouldn’t be too hard to figure out how to replicate it through trial and error. Not only is the design very pretty, but I love the paint job and the way the colors fade one into the next. These tin can lanterns were made using the same principles as the votive candle holders that I shared with you earlier. Once again, you punch designs in them and the light shines through. The difference with these is just the handle which you add on. You could hang these outside for a party and they would provide beautiful ambient light. I can’t enough of this guy! It looks like his body is made of a coffee tin, and his arms and legs are old soda cans. Even his ears have been made out of tin lids. His buttons, eyes, and mouth appear to be soda bottle caps. His cap is a funnel. What a wonderfully inventive creation! I have read that you can make a working camera out of a tin can, but have not been able to locate a tutorial for that. 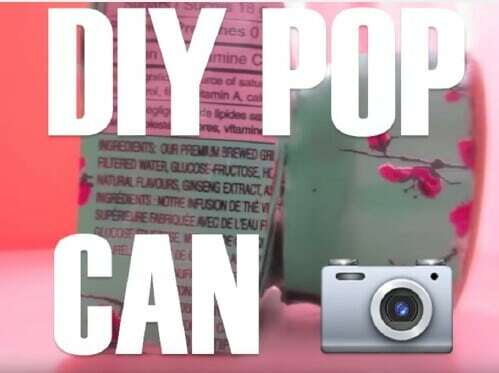 I did manage to snag this video tutorial however, which will teach you how you can make a camera that you can use as décor in your room. It doesn’t shoot pictures, but it is pretty cool! Looking for an easy and fun craft to do over the holidays? 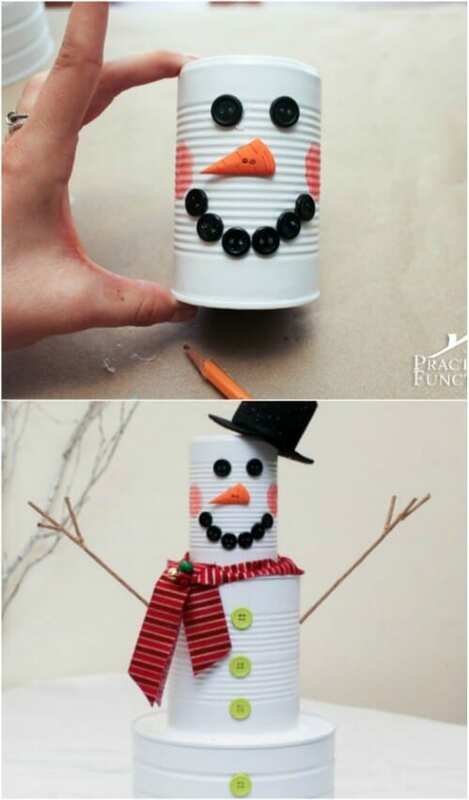 This snowman is incredibly cute, and he looks very easy to make! You just paint a few tin cans white and stack them up one on top of the other, and then add the buttons and other embellishments. This I imagine would be a fun project to do with the kids. Here is a bowling game with a tin cans painted with a Halloween theme. You could easily customize this game any way you chose and pick any theme you wanted. 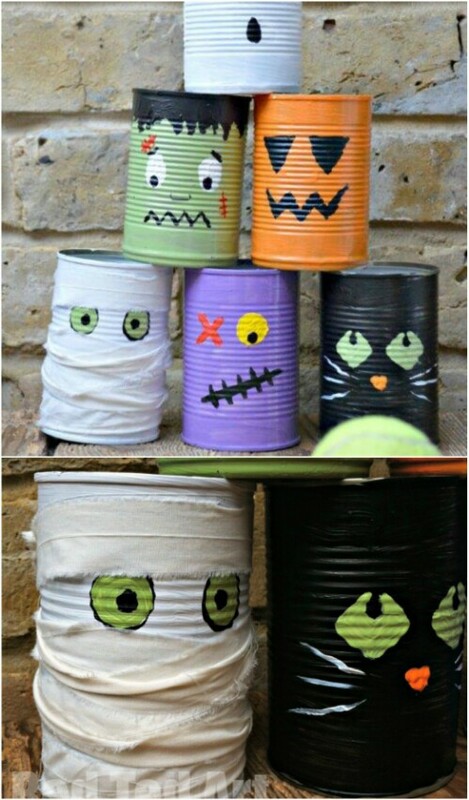 Have fun painting the cans with your kids, and then have fun playing the game. This is a great idea because even after the craft is done, you can play the game forever. 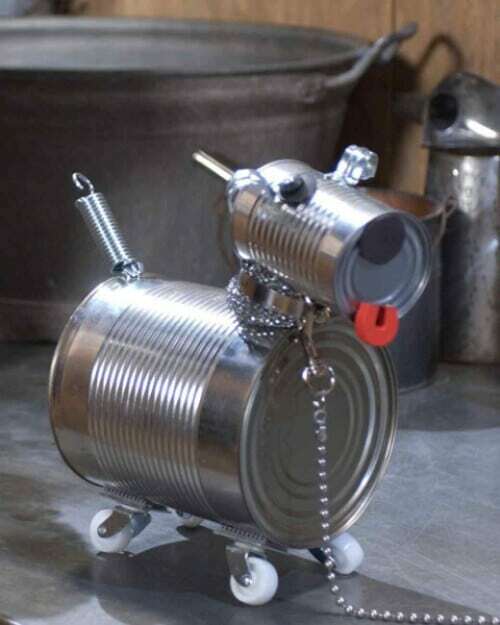 When I saw this tin can robot dog, the Doctor Who fan in me immediately thought of K-9. As you can see, he’s even got little wheels attached so that you can pull him along. 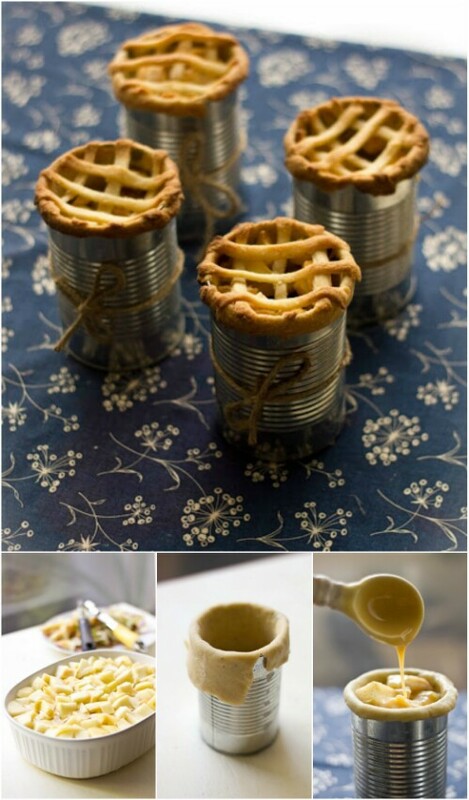 This is a really awesome craft and shows you can design pretty much anything out of tin cans! These planters are amazing, and look how simple they are. 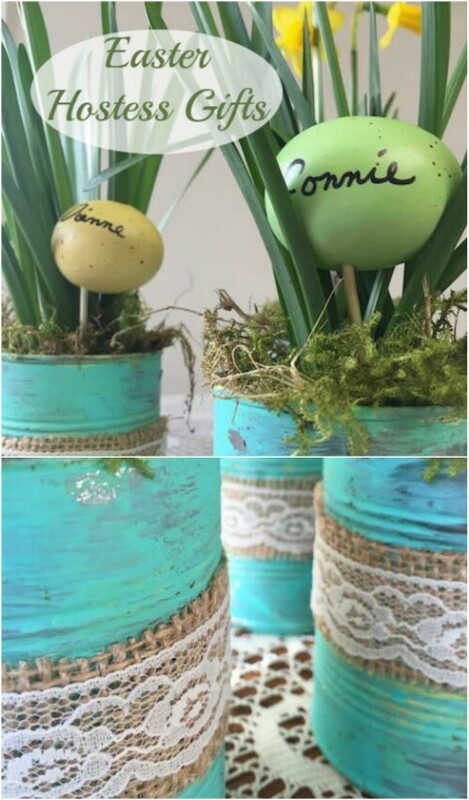 They are just simple tin cans with a coat of paint and some burlap and lace. The burlap and the rough paint job make for a rustic look which is very charming. You could do these in any color, but the light blue looks beautiful! Rustic weddings are all the rage these days, and it is easy to see why. They have this wonderfully old-fashioned charm to them which is just undeniably romantic. A rustic theme is also very DIY-friendly, which translates to budget-friendly as well. 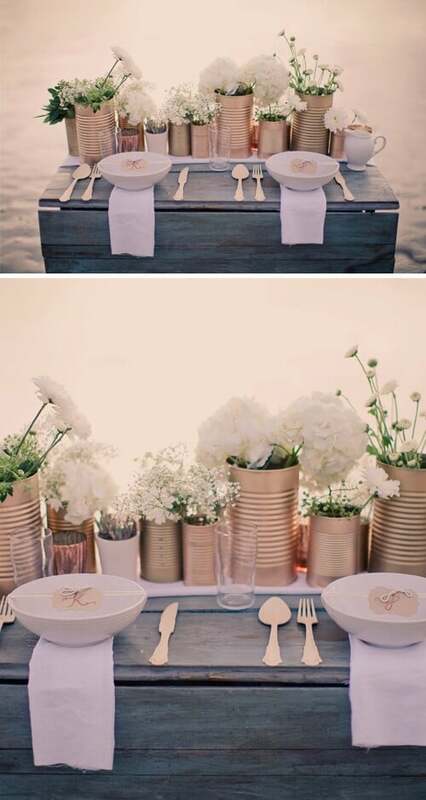 If you are looking for a simple centerpiece idea for a rustic wedding, these tin cans full of flowers make an excellent choice. They’d be very easy and fast to set up! 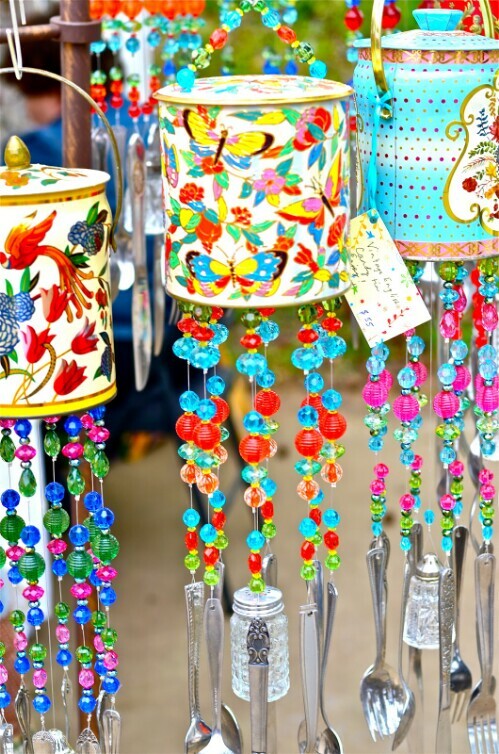 These hanging decorative tin cans have a beautiful design! I like that they have a weathered, antiquated look to them. The little leaves at the tops are a great little accent, and they work perfectly with the leaf and flower designs on the cans. These would make great planters. Be sure to check out the rest of the crafter’s gallery on DA for more outstanding work. 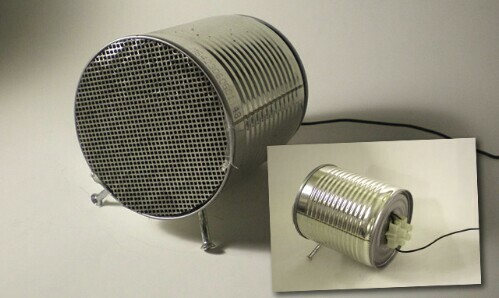 It’s hard to imagine they don’t sound … well, tinny, but these tin can speakers definitely look amazing. Unfortunately the original site where this project was first posted appears to be down, but the creator’s ingenuity is praiseworthy! Don’t have a cake pan, but want to bake a cake? You can actually grease and flour the inside of several tin cans instead. You fill them just over half-full with cake batter and bake them for around 25 minutes on 325 degrees (the exact time and temperature settings may depend on your particular oven). As with baking in a standard cake pan, you can poke a toothpick into the center of each to check if they are done. Wait for them to cool, and then tip the cans upside-down so that the cakes fall out. These cakes have been carefully cut and layered with frosting. They look delicious! Most of the wind chimes I have seen made out of tin cans are made out of the cans themselves. This idea uses the lids instead. All of them have been patterned with lovely designs. Another fun and beautiful project! If you enjoyed the tin man project I shared earlier in the list, you will definitely want to give him a pal to hang out with, and who better than a scarecrow? Like the tin man, he’s been made entirely out of tin cans which have been painted so that he appears to be wearing overalls. A hat and a bandana, some gloves and shoes complete the ensemble. Isn’t he just amazing? More hanging lanterns? I can’t help myself, there are just so many cool designs out there, and these are some of my favorites yet! The artist really went all-out with these patterns, covering each tin can in its entirety. The geometric designs are really eye-catching. 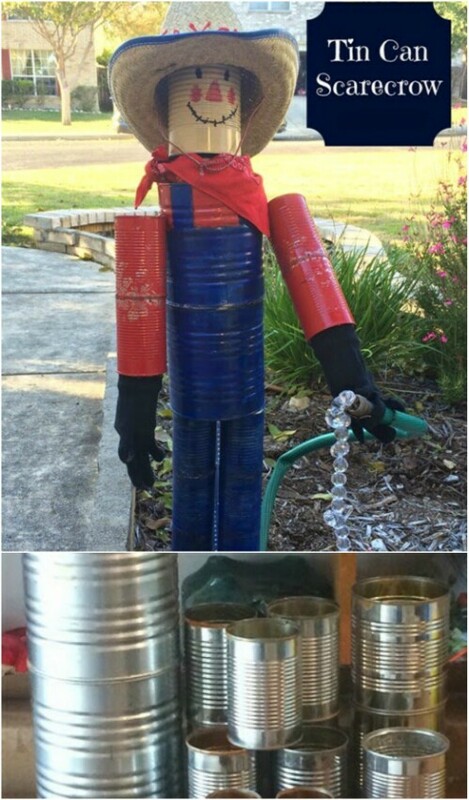 You’ve seen how you can use tin cans to make a tin man, a scarecrow, and even a little robotic dog. Now you can make them into a robot that looks like he (she?) walked straight off of the set of a 1950s sci-fi flick. A very cute project that looks surprisingly easy to reproduce. The beauty of this upcycled tin can is just unbelievable! The artist has gone to quite some lengths to give it an antiquated look. I’m not sure if those are fake flowers or dried ones, but together with the weathered old paper and old-fashioned typeface, they have an entrancing effect. Here it appears to be holding craft supplies, but you could use it for anything. There is a full tutorial! Be sure to check out the rest of Anne’s blog to see more incredible paper crafts. 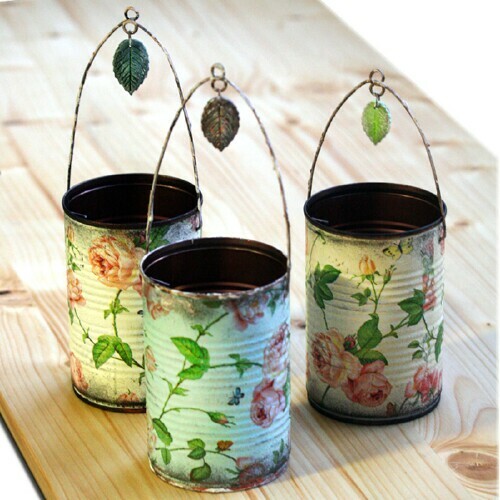 While the upcycled tin can above has a timeworn look about it, these upgraded tin cans have a beautiful shine. Nonetheless, their appearance is still definitely quite vintage. I am loving the pale pinks and the delicate designs. They would add a feminine touch to any home. The trick to doing this project is simply to purchase an existing desk lamp for a few dollars. Once you’ve done that, you can remove the shade that the lamp came with and install a tin can in its place. While this is quite a simple idea, I have to admit that the final result looks totally awesome. And if I didn’t know any better, I’d think that this entire lamp was custom assembled from scratch. It’s a cool project with an industrial vibe, and one that would doubtless get a lot of compliments. Definitely check out the rest of her blog too, there is a lot of cool stuff. 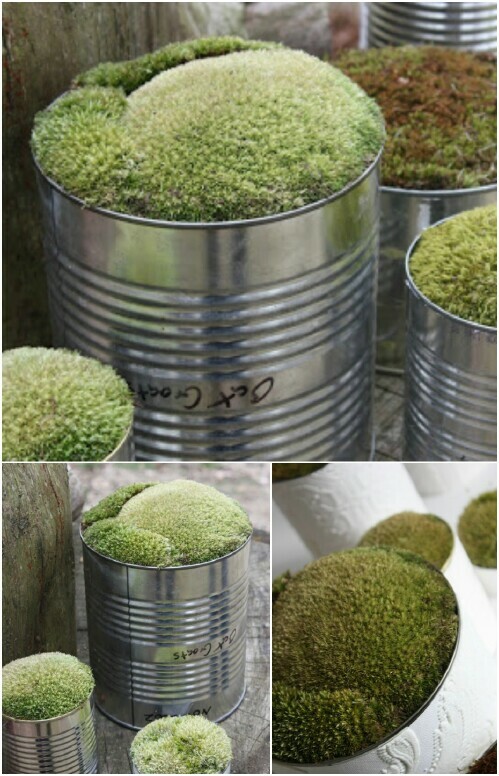 Speaking of an industrial feel, these crushed tin can planters are awesome! This is yet another simple idea perfectly executed. The effect is very much like modern art. I imagine the challenge is to make sure that it looks deliberate. The key to making it work may be the paint, which is flawless. If you want to grow an indoor herb garden, this is a unique way to do it. 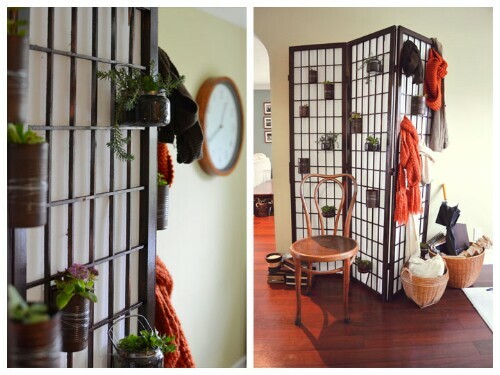 Buy one of these room divider screens and set it up, and you have a ready-made grid which you can use to place the tin can planters. They have been painted with the same color as the wood so that the whole ensemble looks like it was made for this purpose. It is pretty and functional. Okay, so maybe this isn’t exactly a replacement for your Christmas tree. But it is a fun craft to do with your kids. You just paint the tin cans green, and then pick up pom poms and pipe cleaners and little bows (or whatever else you want to use). Let your kids decorate the “tree” any way they want. It’s not bad practice for decorating the real tree, and you can display their cute creation all through the holidays! 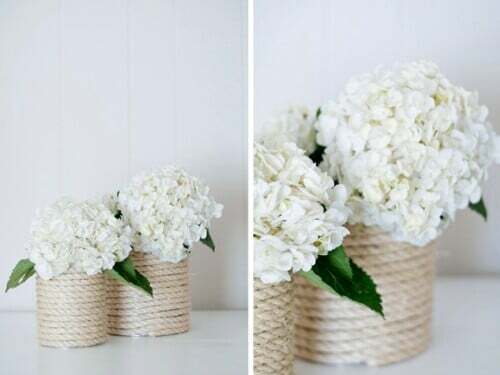 Like a number of the projects here, this one is to cover a tin can with scrapbook paper in order to spruce it up for a flower arrangement (or whatever else you wish to use it for). I particularly recommend checking out this project because the tutorial is excellent, and walks you through the process step by step. So even if you are a total newbie to this type of craft, you will know exactly what to do. 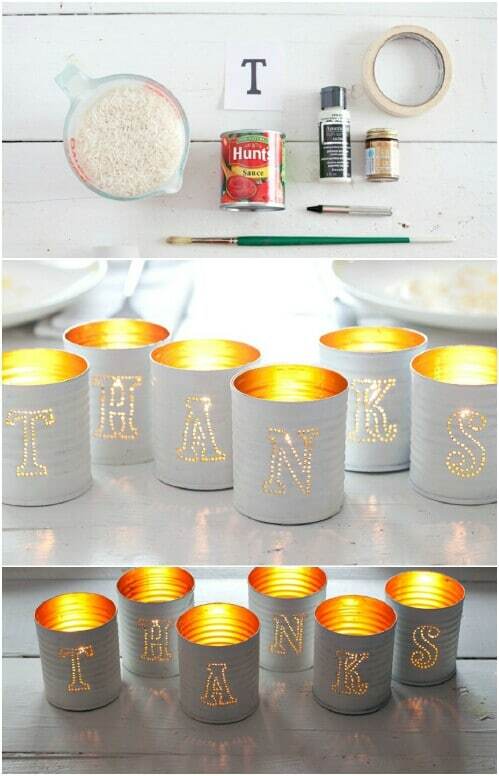 This tutorial will teach you how you can make tin cans into fancy pedestals for candles. You will learn how you can buy or make stencils which you can use to paint letters or designs onto your tin cans. The finished pedestals look really cool! A lot of tin can projects try to disguise the cans with paint, paper, or fabric to conceal the metal. But the metal itself can look really great. 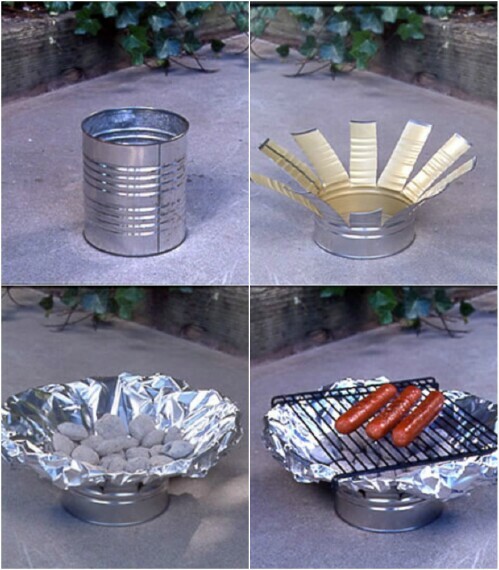 This project for tin can containers does not attempt to conceal the tin. In fact, it uses the tin to its fullest aesthetic advantage. Simple metallic embellishments have been added to the tins (those coins on the tin in the lower left-hand corner are awesome!). The lids are teacups! The finished result is obviously tin, but these containers make you think of fancy dishware and not of tin cans. 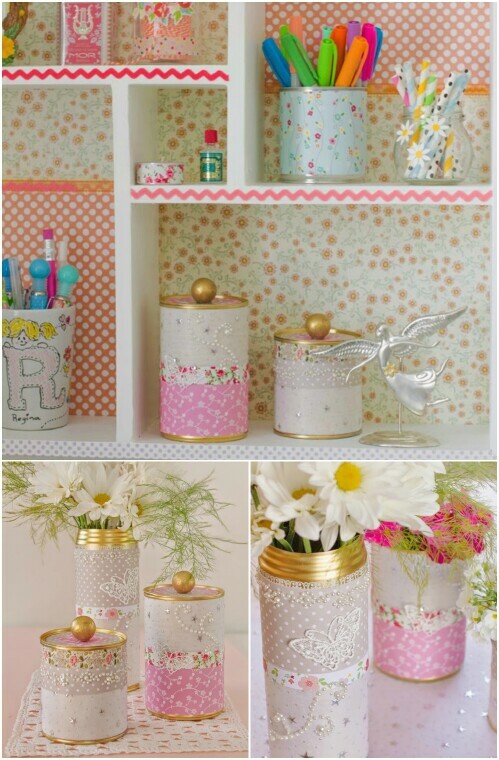 Punching holes in tin cans is a great way to create pictures and designs. These are relatively simple designs which are perfect for the winter holidays. You could of course use this idea to create any images you wanted. Votive cans are a popular gift for the holidays, so I am liking the Christmas tree and the snowflake. 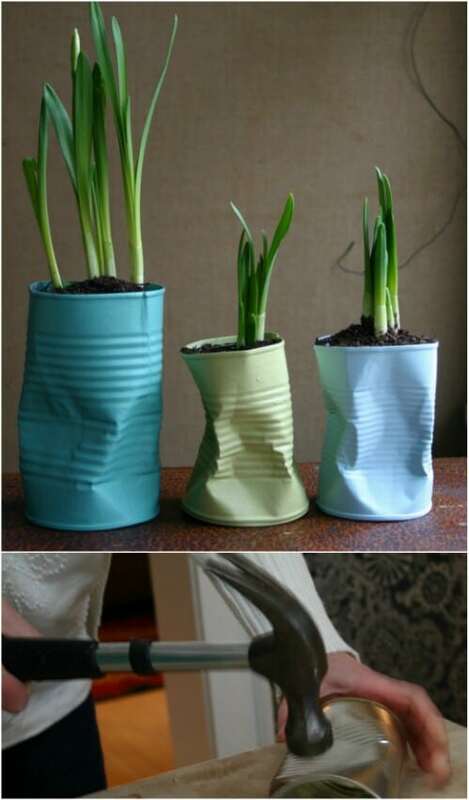 What a great idea for easy, fun, eco-friendly gift-giving this year! 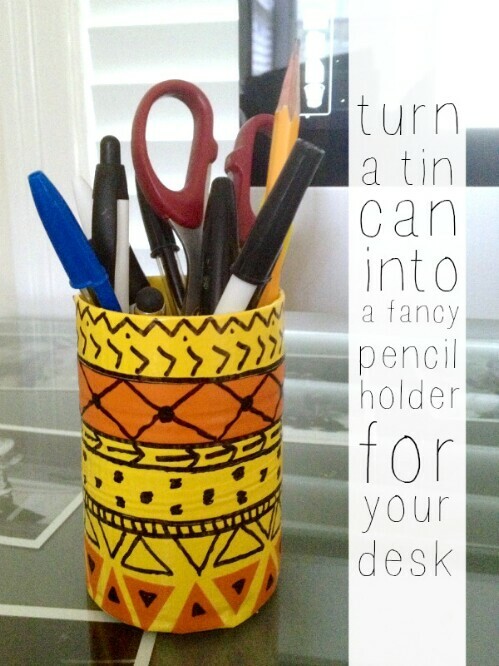 I hope you found these 50 tin can projects as inspiring as I did! I am so excited to try the projects on this list—I have a couple planned for the next week, and a long list to try over the course of the year. No more throwing away tin cans—I’m salvaging them all! If you try any of these projects, be sure to share your results with us in the comments below! I can’t wait to see what you do! Be sure to point us all toward any other great projects you know of that I may have missed as well! Can I use your post to add it to a small group of Friends who love to Re-use, Re-purpose and Re-new our trash. 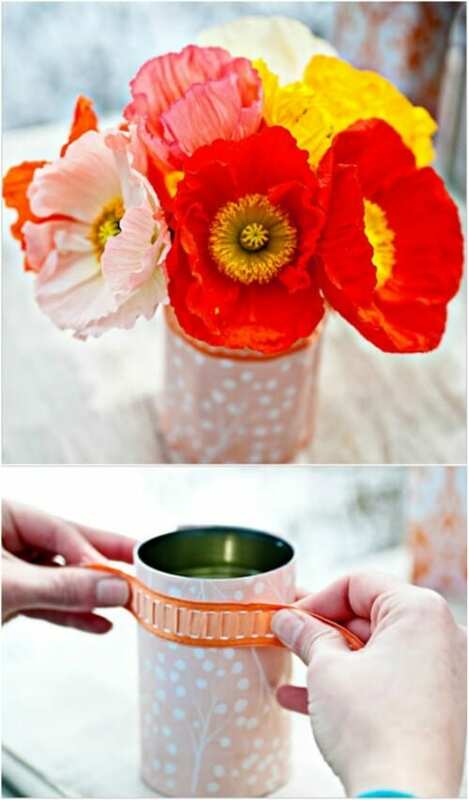 I have searched your page for the repurposing coffee cans ideas and can’t find it anywhere. I clicked on the link from facebook but it doesn’t pull up coffee cans only tin cans. Can you direct me to this idea? Did they ever get back to you about your request? I am looking for the coffee cans project, too, and I can’t find it either. Thanks.